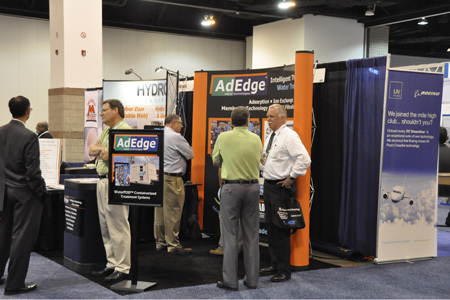 Water Online Radio: Explain to our audience what AdEdge Technologies does? Rich: Our primary interest has been delivering water treatment systems for municipalities and taking out a host of contaminants. Our claim to fame is that we have more systems for arsenic removal than any other company installed around the world. In addition to that, we've had to grow our treatment technology offering to communities over the years because most wells don't have just a single problem of just arsenic, they have a multitude of contaminants. We've been able to grow our business and our company by offering more treatment technologies, as well as being able to diversify the number of contaminants that we can remove. Water Online Radio: Greg, I know you are very focused on the international market. Give us an update on what you're doing in that arena. Greg: Well, we've certainly seen an uptick in that activity. In particular, what seems to be driving that is the interest that folks have on our water pot systems. Those are the containerized treatment units that we're providing that make it easy for folks to put in our systems where there may be a lack of construction companies, infrastructure, different on the ground resources to put in treatment systems. We've seen a lot of nice activity in Latin America and also in Canada in the last twelve months. Water Online Radio: Why is the water pot product so revolutionary and why is it resonating in the market? Greg: I think, especially in developing countries, it benefits those that really don't know how to mobilize resources, first of all. They don't even know anything about the treatment system itself. There's a lack of understanding, technically, about what the treatment system is, how it works, and then you extend that to the fact that they don't have information on how to even put it together, how to assemble it, how to plumb it together to make it work. What we do is we do that in the shop, before it ever leaves the facility. It just makes that whole process of execution much, much easier to do. Water Online Radio: Rich, you talked about arsenic removal a minute ago and I can't help but think about Helping Hands for Water, which I know a little about. Share with our audience what that's all about. Rich: Helping Hands for Water is a 501(c)3 charity that we and our employees started. The intention is to work with communities around the world that are impoverished and might have arsenic in their water or other contaminants that might be consistent with what we remove. We try to find the solution so that they can get clean water and improve their lives by taking those contaminants out. That's the secret of really the motivation and the passion of our company and what our employees have. Water Online Radio: What about this film that you guys were involved with which recently had its world premier. Tell us more about that. Rich: Yes, the film is called Troubled Waters, and the website is http://www.troubledwatersfilm.com. The film premiered in North Carolina about two or three weeks ago, to an audience of several hundred people. It involves a community up in the Andes Mountains, where they have arsenic levels extremely high, well over 250 to 300 range of parts per billion of arsenic.